Creating content for a new message? Learn how to use the plain text editor here. Plain text is text that is not tagged, specially formatted, or written in code. It's important to include a plain text version of your HTML message and here's why: There are still some devices that cannot read HTML. It's better that your customers see a simplified version of your message rather than nothing at all. Also, Listrak (and most every ESP) sends emails in a multi-part message (MIME) format. This means that our technology is capable of sending both parts (HTML and plain text) at the same time. If an ISP, such as Gmail, Yahoo, etc., receives messages in a MIME format and one of the parts is missing (i.e. plain text), they could consider this spam and move your messages to the junk folder. Click the plain text tab. Type your message content. TIP: Try writing a shorter version of your message with plain text. Why? Some devices that do not read HTML may have a limited screen (think Apple Watch). A shorter message will be easier to read and lead to a better customer experience. 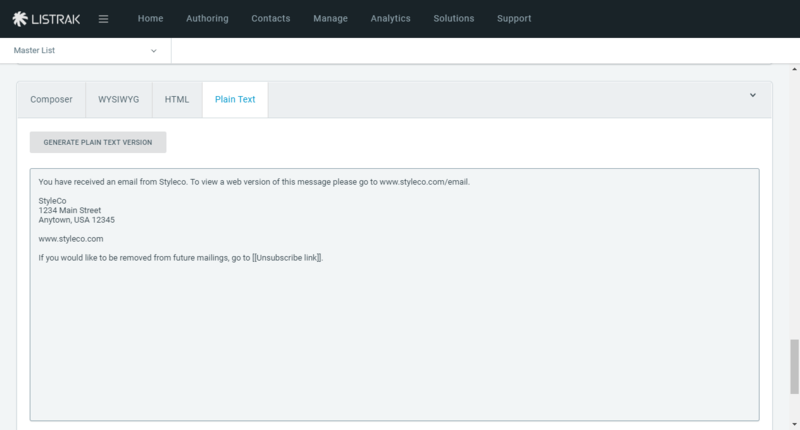 Test the plain text version of your message by leaving the WYSIWYG and HTML sections empty and clicking send test. Below are some basic guidelines for using plain text. Read more tips from our blog in the article Apple Watch, What are We Going to Do with You? Plain text will strip out all formatting, images and hyperlinks. NOTE: Most email clients will automatically render a hyperlink when a URL is recognized in the plain text. Personalization will still work in plain text. Special characters such as smart quotes or mathematical symbols may not appear correctly in plain text messages. Fonts will appear as the default size, type face, and color setting of the contacts' computers. Bullet points are often translated as an ampersand symbol (&) or other symbol. To avoid this, use a hyphen (-) instead of a bullet point.